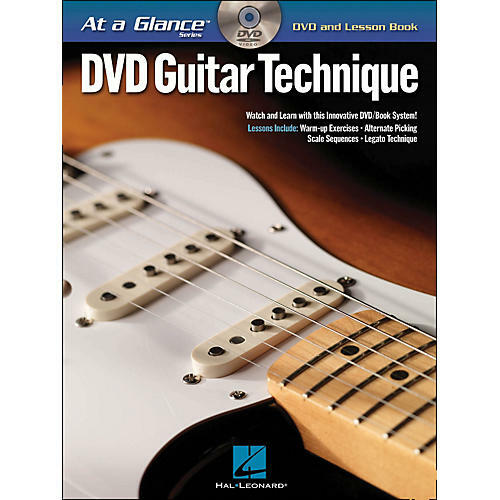 A first of its kind, the At a Glance series pairs an instructional DVD lesson taught by a professional guitarist with a supplemental¦book for a comprehensive learning experience. Each book/DVD features¦several lessons pertaining to one topic, and¦the DVD lessons feature on-screen music.¦The lessons¦are loaded with valuable tips and information, and¦song examples¦help to demonstrate the¦concepts¦in action. Guitar Technique - At a Glance features four lessons: Warm-Up Exercises, Alternate Picking, Scale Sequences, and Legato Technique. Includes 19 songs: Addicted to That Rush • Cliffs of Dover • Don't Tell Me You Love Me • Get the Funk Out • Peg • Rock You like a Hurricane • and more.